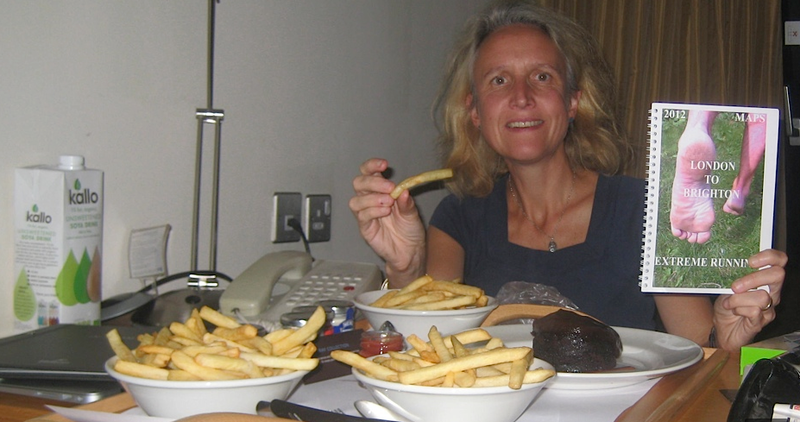 The night before and chips for all the family – honest!! After over a year of anticipation, the day finally dawned – although I should say the alarm went off at 4:30am, 2 hours before dawn! Registration at the TA Centre in Blackheath closed at 5:30 and I had a DIY breakfast of potato farls in the hotel room (ever smuggled a toaster into a Hilton before?). Dave drove me there and waited to see me start. There was quite a buzz about the place and good facilities. They do a bag transfer to the Finish, but we didn’t use it. Dave picked up his own Route Book, which was handier than the photocopies I’d made. Road support is quite tricky when you don’t know the area and have children who won’t navigate for you! I later learnt that there were 196 of us at the Start and I soon found myself at the back of the leading pack of 5, bearing left down hill across the grass. The bit through Lewisham and Catford is fiddly – through a mixture of back streets and urban parks. A torch was necessary for the first half hour or so. There’s an unlikely bit where you go through a retail park after Catford Station, then you run alongside the Pool River to the first hill at Bellingham. People were starting to overtake me here and I made an error coming out of a wood on the golf course which meant I ran extra distance round a field. 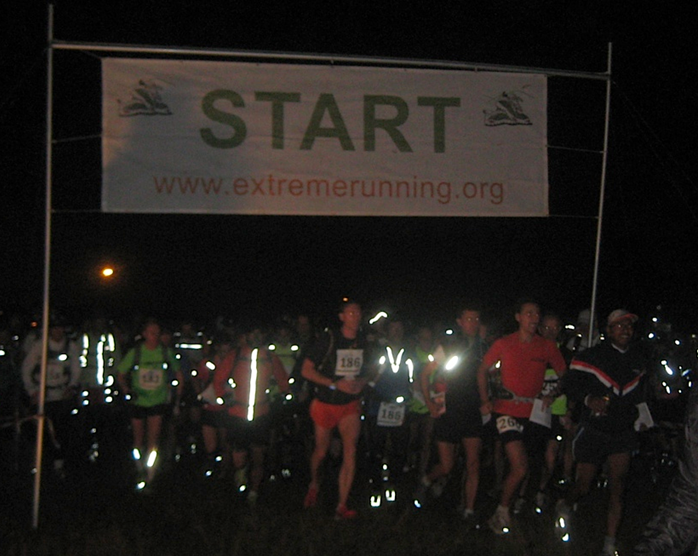 I got to Bromley Station at about 6:55, you then stay on a B road for 5 km to the first checkpoint at Keston. I arrived there at 7:38, 3 mins behind my 12hr schedule time but still pleased. There was plenty of water so I filled my empty bottle (hadn’t carried any for the first 10 miles to save weight) but only bananas so I had some food I’d carried. Suddenly the route is in the countryside and the navigation is very tricky. I lead whatever pack I was now with to Furze Bottom, from which you can see a column of runners walking up towards Biggin Hill RAF Station. After that it’s up the nose of Biggin Hill itself and over some flinty ploughed field to Tatsfield, where there’s a nice village green for supporters to hang out – but mine were still emerging from the hotel! A kilometre later was the first of the day’s permitted detours across private land. These two places are the only bits where the route is signed. A stile had apparently been put up across a barbed wire fence but had been removed so we climbed over some wobbly tree branches. After that you cross a bridge over the M25 just west of Clacket Wood Services and climb up to another nice village, Limpsfield Chart. Dave and the girls met me here at about 9:30. Had some food and water but didn’t hang around for the coffee. This race is so long that every minute counts! The organisers even warn you not to start walking just coming up to any stiles!! Had a navigational wobble and went wrong way to Checkpoint 2 but only minimal extra distance but 5 mins hesitation error. Got to checkpoint at 9:40, 25 mins behind 12 hour schedule, which was worrying but I was running well and not feeling too tired. They had the legendary cold roast potatoes here and they went down very well! 3km along farm tracks then you cross Edenbridge Golf Course then some paths on the Eden Valley Walk where you need a compass. Dave met me just east of Dormansland and did 4 miles with me, which he then had to reverse to get back to the car! The route is hilly but very pretty as you approach Checkpoint 3 at 28 miles. Got there at 11:35, again 25 mins behind schedule, but no increase in slippage time which was good. 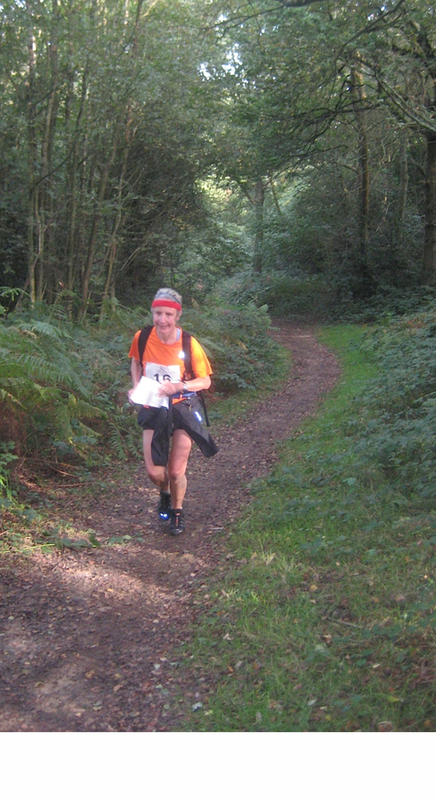 Coming into Ashurst Wood, I’d got lost on my reckie and still did it sub-optimally – but at least I didn’t have to resort to navigating with my i-phone! You then go east round Weir Wood Reservoir on more farm tracks and up into Lavender Platt wood where there’s a car park where spectators can meet you. Mine missed me, but everyone else’s supporters give you a good cheer! Then it was a nice run into Checkpoint 4 at Horsted Keynes past some very secluded farms and forestry. Exiting Pound Common I went the wrong side of a farmhouse and had to run 3 sides of a square and cross 2 barbed wire fences in thorns. After this I can’t remember much until Checkpoint 5 at Chiltington, 48 miles, where I arrived at exactly 4pm. That the 10 mile section to the Finish took 3 hours 7 mins shows how slowly I was going, but I was still running. 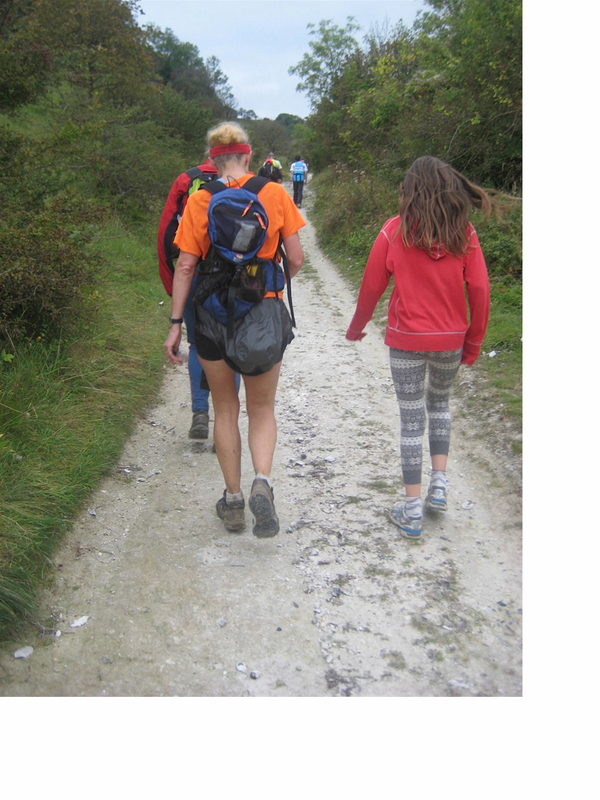 There’s about 1000 ft of climb over the South Downs and Dave and the girls did the main ascent up Black Cap with me. On this section you are on walkers’ footpaths so the navigation is easy. You take a bridge over the A27 at Falmer and go parallel with the very fast Falmer Road but in the fields, just on the verge for about 300m. Then you run along the seemingly endless north edge of Woodingdean and turn south onto Brighton Race Course which is very nice running with great views. 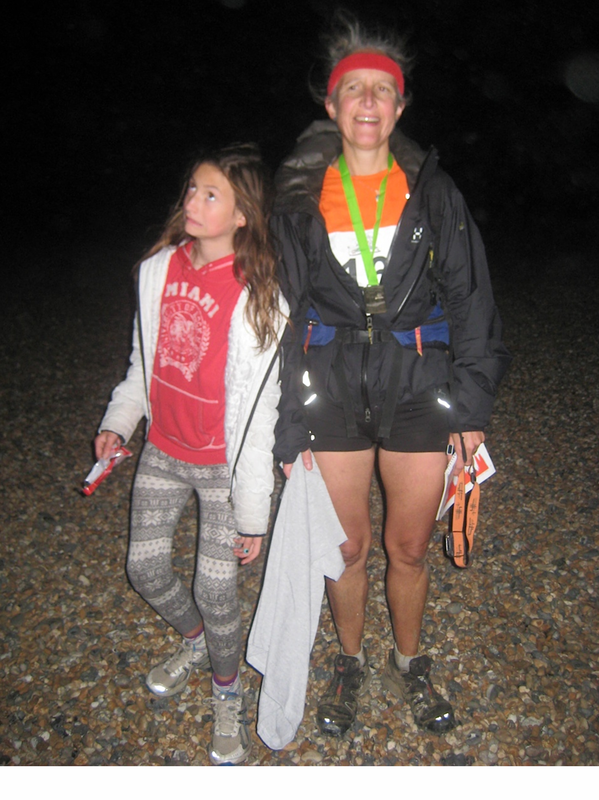 It was dark by now and I had a black cagoule on so although Dave had reversed the route from the Finish, he missed me and Zoe had to phone him from the Finish. It’s bizarre but great running down into Brighton on a Sunday night and then onto the beach. It’s a shame I didn’t make it in the 13 hour cut off, but the Finish was still there and I got my medal and T-shirt but was disappointed not to be listed in the Results as just 88 of the 196 starters ran under the time limit. We’d arranged to have tea and a shower at a friend’s house in Saltdean, which was lovely. She had put me in touch with a friend who’d done it 2 years ago and who told me to reckie – which was excellent advice, without which I’m sure I wouldn’t have finished. We got back home to Derbyshire just before 1am and I had the next day off work but was in for a 12 hour shift on the Tuesday, still stiff! Much better on Wed. lots of good memories – and better still, Dave wants to do it next year! on October 30, 2012 at 1:04 am | Reply Eddie C.
Hi Eddie, Thanks, bet u r in good shape! Had a look at some of the crossfit stuff but more interested in the Paleo diet, how long have u been on it? and what made you start? I took a blood test in Feb and found I was intolerant to milk, yeast and a few other things, which I cut out, and lost a stone within about 6 weeks. My race times have gone back to what they were about 5 years ago so I’m really pleased with it. My ideal meal is steak and chips and I don’t have many puddings as the yeast restriction means I need to cut down on sugars because yeast feeds on them. Wow Sal – sounds like an epic! My legs are aching just reading it!